Debit cards remain one of the most frequently used forms of payment. 70 billion debit transactions take place each year in the U.S. alone. According to the latest study from the Federal Reserve, debit card transactions made up 67 percent of all card payments in 2017. Optimizing your debit program requires a deeper understanding of how and where your members are engaged in and using their debit cards. To help credit unions build a roadmap for debit portfolio optimization, CO-OP partnered with Mastercard and Mercator Advisory Group to conduct a comprehensive study of the debit industry. The study analyzed survey responses from more than 240 U.S. credit union executives related to debit card usage, issuance, and management. While ATMs and in-store payments dominate debit card transactions, the proliferation of mobile phones and the shifting demographics of debit card users is quickly changing the debit experience. 80 percent of survey respondents believe that offering members the ability to manage their debit accounts with a mobile device is extremely important. A full 87 percent of survey respondents offer their members service through a mobile app, and 55 percent report that members have enrolled their debit cards in mobile wallets. However, mobile debit card usage still has a long way to go. Members are still reluctant to set their debit card as the default card for mobile payments. Additionally, less than 50 percent of credit unions are actively marketing their mobile debit solutions. This represents a huge missed opportunity for credit unions. 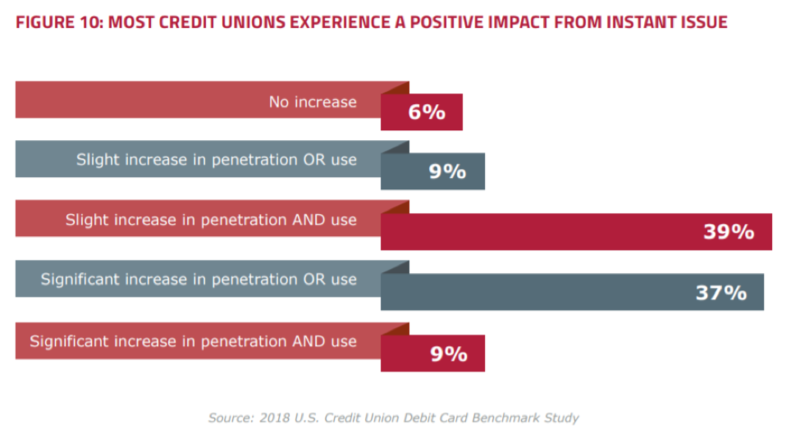 Credit unions must focus on promoting debit as a viable option for mobile wallet payments and then encourage active card management through features like card controls and alerts in order to meet their members’ digital expectations. Credit unions are relying on a variety of tactics to encourage members to activate and use their debit cards. Instant card issuance is among the most prevalent strategy, with 63 percent of survey respondents currently offering or planning to offer it. As a result, they are seeing a higher ratio of debit cards to checking accounts. Nearly 40 percent of respondents indicate their credit unions have achieved a 70 percent or greater debit card-to-checking account ratio due in large part to instant issuance. Debit rewards are another promising tool for increasing debit card usage. 55 percent of respondents said they are considering or actively offering debit loyalty rewards. However, the cost of launching and maintaining these programs, as well as changes in the way merchants handle signature vs. PIN transactions, are leading credit unions to re-evaluate the benefits of debit rewards – even if they are not discontinuing these programs altogether. Our study revealed that 50 percent of debit fraud occurs without a physical card present, either through an online or phone transaction or as a result of card skimming. 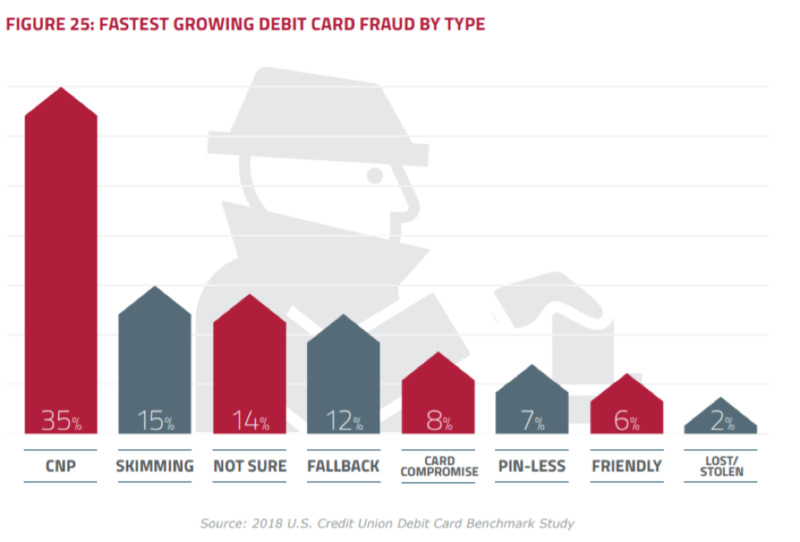 Credit unions are increasingly concerned about card-not-present fraud, particularly as it can deter members from using debit for online transactions. Leveraging account-based fraud mitigation tools delivered by industry-leading processors was said to be extremely effective by 41 percent of our survey respondents. Particularly now that members are transacting on multiple channels, account-based fraud mitigation tools that provide a more comprehensive view of a member’s transaction activity are far more effective than manual review of individual fraud cases. That is what CO-OP’s COOPER fraud mitigation solution aims to do by using a 360-degree view of the member to detect and adapt unusual spending patterns. While the credit unions who participated in our survey expressed optimism around the continued growth of their debit offerings, all agreed that meeting member expectations will be increasingly challenging. 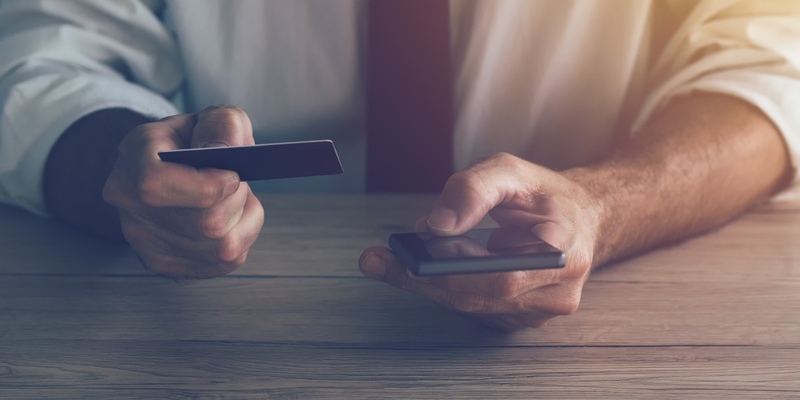 Delivering an omni-channel debit experience will require a comprehensive set of solutions designed to turn your debit offering into a differentiator. Read the 2018 Debit Benchmark Study to discover where credit union members are engaged in and actively using debit products and discover strategies to help boost debit penetration, activation and usage.